digital detox (n): a period of time during which a person refrains from using electronic devices such as smartphones or computers, regarded as an opportunity to reduce stress or focus on social interaction in the physical world: break free of your devices and go on a digital detox. If we need camps, apps & programs to help with digital detox then we’re doing it wrong. It’s about balance. Balance comes from discipline. I can see how a digital detox could be powerful for some people. I imagine one benefit is that it creates an experience for them to aspire to long after the weekend is over. It creates a moment that they can recall and try to replicate on their own. One such digital detox camp is called The Digital Detox. Their mission is to provide people with the opportunity and permission to put aside their digital arm and ”re-format” their own personal hard-drives… so they can return to their job and family feeling rejuvenated and relaxed, with a new found perspective, in order to live a more balanced life online and off. Has our ability to maintain some type of discipline in our lives declined so much that we need to attend actual camps and weekend retreats where we are basically paying for other people to hold us accountable to not use our devices? I’m afraid this is the reality we live in. Last fall, I went to Europe my myself for three weeks and I remember at the beginning of the trip, I had a hard time getting to “vacation mode”. It wasn’t until one morning when I was in my hotel room reading the Business Insider 10 Things You Need To Know In Tech Today that I thought to myself, I actually don’t need to know this. It was hard to unplug, but I did for the rest of the trip. When I got back though, my behavior didn’t really change. I was still tethered to technology. A temporary break from a device of addition will likely not result in a long term habit change. It’s not enough to just cut technology out of our life for a weekend or holiday. Sustained change in our relationship with technology will only come when we reprogram ourselves to be more disciplined in how we let technology permeate our lives. In the Wired article, Can’t Get Away From It All? The Problem Isn’t Technology — It’s You, Mat Honan (@mat) tells the story of hiking the California backcountry with his wife and the experience of having the discipline to use his phone as a tool on the trip (for GPS and apps to help them identify constellations) rather than being tethered to every notification and social update. Honan suggests that rather than focusing on taking temporary breaks from technology, we need the discipline to live with it at all times. I believe one of the biggest problems we face is the element of discipline — learning how to set boundaries for how we live with technology. This challenge is only going to increase as technology becomes more embedded in our lives through being wearable, consumable, and central to so many experiences we’ll have in the future. Why are we so bad at discipline? 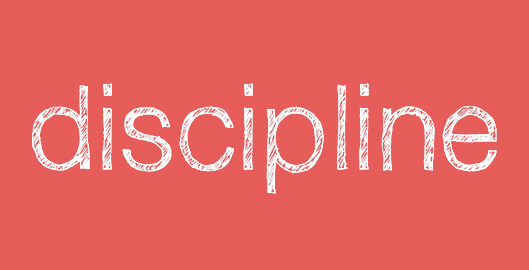 The root meaning of the word discipline involves training and knowledge. One definition from Oxford Dictionaries that I think is fitting says to train oneself to do something in a controlled and habitual way. My guess is that the problem we have trouble with discipline lies in the landscape of technology in our lives. Technology is changing so fast that there’s never a period of constant long enough for us to develop any meaningful and lasting habits around how we use technology. How can we develop discipline in such a dynamic and distracting environment? I’m really curious about the impact of technology on our lives as a society. I definitely don’t have any solutions, but I think there is something very intriguing in the space of discipline in technology. Do you struggle with being disciplined in your use of technology? What strategies have you tried to help regulate technology in your life? Or, do you even feel like technology is a distraction? I’d love to hear your comments and thoughts on this idea.